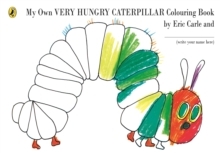 A colouring-in version of Eric Carle's classic The Very Hungry Caterpillar. This colouring book is a black and white version of the original and classic favourite, The Very Hungry Caterpillar. Eric Carle fans and budding illustrators can now bring this bestselling story to life, in their own colours and style. The activity is accompanied by the full text of the story so that children can enjoy reading along as they colour in the pictures. Eric Carle is an internationally bestselling and award winning author/illustrator of books for very young children. He was born in New York, but spent his early life in Germany. He returned to the States in his early twenties and worked as a graphic designer for the New York Times. He went on to be the art director of an advertising agency before he began writing and illustrating children's books.